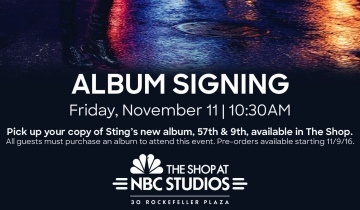 To celebrate the release of 57th & 9th this Friday, November 11, Sting will be at The Shop at NBC Studios in New York City from 10:30AM ET for a special album release day signing! All guests must purchase a copy of the album in order to attend the event – either at the Shop for the event or via in-store pre-order, available this Wednesday, November 9. I bought bus tickets from Baltimore for this event and was just told by the NBC Store that you cannot order the album over the phone or online. Will Paypal for two albums! e-mail me mg.wilt@gmail.com, 30+ year fan!!!! It appears that the album will be for sale the day of the event, is that correct? Hi all is anyone going to the album signing on Friday? I can't go on Wednesday to the pre-sale to purchase the voucher for the album signing and would be grateful to someone to get me one when they go and I would meet up with you Friday morning in line. Anyone?